Unlike ABC’s Q&A, the panel for the Rachel Funari Prize for Fiction is chockers with excellent women. Over the next few weeks, Lip will be getting to know our judges, so you can meet the writers who will be reading your work. 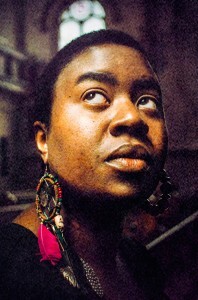 This week we are featuring Maxine Beneba Clarke, author of Foreign Soil. Primarily I have my head down finishing the last part of my memoir The Hate Race, which will be published next year. In terms of my fiction I’m working on a number of short pieces for various forthcoming publications. I’m also teaching an online short fiction course through Writers Victoria, and guesting in a few schools and universities around Melbourne that are studying Foreign Soil amongst other smaller projects. All of the collective experiences gathered over on the twitter hashtag: #writingwhilefemale! What first springs to mind when I think about the notion of Privilege is the notion of inherent advantage. Deconstructing or understanding one’s privilege is about acknowledging circumstance: in particular being aware of factors in one’s life which may impact their interactions with others – whether it be race, educational status, socio economic status, gender, disability or a whole range of other things. When we acknowledge and engage with the factors which may implicitly give us advantage over others or others advantage over us, we become more aware of barriers to equality or fairness. There are, of course, many other meanings and associations, but this is the first which springs to mind for me. The most recent Stella Prize Count demonstrates that women’s voices are still significantly underrepresented in many areas of writing. In 2015, this is unacceptable. Women hold up at least half of the sky, so I would like to hear them at least half at the megaphone. Why have you agreed to judge the Rachel Funari Prize for Fiction 2015? I’m interested in supporting writing which places women at its centre. Interesting, brave, exciting, passionate and engaging words. You can find out more about Maxine here. This entry was posted in Arts, Books and tagged maxine beneba clarke, the rachel funari prize for fiction. Bookmark the permalink.